Getting your child to a doctor’s appointment shouldn’t be a dangerous feat, but for families with children with disabilities, it can be that and much more. When a car breaks down on the side of the road it’s just an inconvenience for most of us, but, for families like the Fullingtons and the Hoffmanns, it’s actually life-threatening. Thankfully, there are organizations like the Steelman Family Foundation who assist families when trying to purchase a wheelchair accessible vehicle. May 10th was a special day for all of us involved. 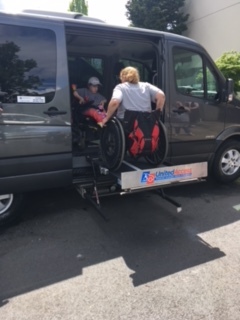 The Hoffmann and Fullington families both drove home in their new, safe, and reliable wheelchair accessible vans from Performance Mobility in Portland, a United Access owned company. Thanks to the Steelman Family Foundation and their generous donors for helping to make this happen. The Fullington Family will be leaving in their new BraunAbility Toyota Sienna XLE. This Toyota comes outfitted with a power, foldout ramp making everyone’s life a little easier. The Hoffmanns will be driving away in an extra special vehicle, a BraunAbility Sprinter which was customized to accommodate two wheelchair users for both mother and daughter. Kira Fullington is 14 years old and is completely dependent on her family for her care. She’s 100% wheelchair dependent. She needs to be transported in her wheelchair both due to her size and the fact that transfers need to be kept to a minimum due to her osteopenia (weak bones). Kira also deals with seizures and autonomic dysfunction making long transportation times on public transit difficult as she often is unable to regulate her body temperature. Kira comes with a lot of “stuff,” meaning she has a trach and is vented, so oxygen tanks go everywhere that she goes. In 2008, the Fullington family moved from Idaho to Oregon to get Kira access to better medical care at Doernbecher Children’s Hospital. They moved in with Ken’s parents as they were getting to a point of needing help with the house. Ken, Kira’s father, is 100% disabled with significant mobility issues in his knees. In addition to being a full-time caregiver to her daughter and husband, Mrs. Fullington also provides full-time care to her sister-in-law. The Fullingtons have had nothing but trouble their current wheelchair accessible van. Their mechanic has been working on for months and is afraid it’s beyond help. This leaves them unable to transport Kira, their daughter, for anything other than medical appointments, for which they use med transport. Last summer, their van broke down and left them stand. For most of us that’s an inconvenience, but for Kira, it’s life-threatening. Teryl Hoffman lives in Oregon and relies on social security as her source of income. As you can imagine, that creates quite a financial burden. Teryl has an amazing family story of strength and fortitude. Three months before her daughter was born, she received a phone call from Connecticut asking if she would be interested in adopting a little girl. When she was born, Teryl was told that the baby would not survive. They gave her six hours at most. When she pulled through, they gave her six weeks, then six months at the most. Well, 14 years later she’s still fighting and thriving! She’s the only person to survive with her combined diagnosis. Bryten has a rare severe form of Osteogenesis Imperfecta (OI) also known as brittle bone disease. Her genetic type is rare enough that it is not yet numbered. Only one other person has been diagnosed with this type, but passed away at 19 months of age. Bryten also has a secondary form (type 16) that no one has survived past birth. Because of her severity, every transfer is a risk for a broken bone if not done properly or safely; even then, she often breaks. Bryten has broken more than 1000 times by age five. She has suffered from low oxygen multiple times in life and has developmental delays as a result. She also has many secondary issues resulting from her OI such as respiratory issues, slowly losing vision, long bone deformities, and is now developing spinal rotational collapse. She also has a depleted immune system and ACD secondary to chronic bone fractures taxing her body. She gets a series of life sustaining infusions every eight weeks in Randall Children’s Hospital in Portland. Through it all she loves life. Teryl currently has a 21 year old lift van that is in need of serious repair. Their van is too small to easily house a power chair, a Rodeo stroller, a manual chair, a scooter or walker, and three people. Even when it is just her and her daughter, they need to haul three mobility devices. There is always a need for a stroller for emergency backup; if Bryten breaks while they are out, she cannot drive her power chair. Teryl’s, who is also a wheelchair user, needs to count for her chair to fit into the equation. Now both families have the freedom to do all of the things they love to do.